The Niagara County Sheriff's K-9 Unit will be at the Niagara County Fair to demonstrate and talk about the use of dogs in their work. Deputy James Hildreth(right) with his partner 'Ciro' a 16month old German Shepard patrol dog will perform demonstrations on how Ciro helps in the everyday work of patroling. 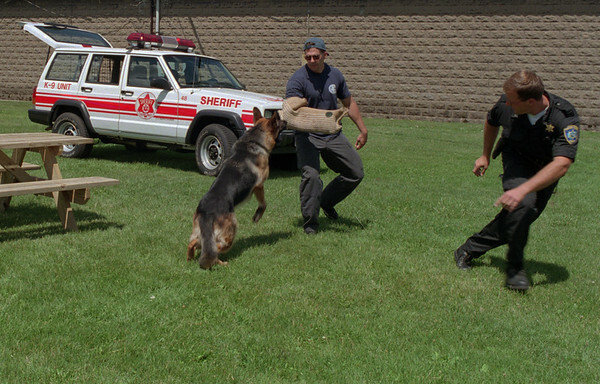 Here, Ciro works out with Deputy Steve Preisch during a demo on how Ciro will attack a potential suspect . Deputy wears a protective arm sleeve and Ciro is trained to go after that arm band during demos.